Could Wheat be Destroying Your Thyoid? Let’s talk about gluten and your thyroid. Out of all of the diseases that are associated with celiac disease and gluten intolerance, autoimmune thyroid disorders are one of the most striking examples. In fact, the connection is so strong, that I would urge anyone who has a problem with their thyroid not to “think” about eliminating gluten from their body, but to immediately cut all gluten from their diet. 90% of thyroid disorders are autoimmune in nature. This means, 90% of the people who have thyroid disease (and there are a LOT of us out there) have a problem with their thyroid because their immune system is mounting an attack against their thyroid. Scary! So, what does this have to do with gluten? Maybe you’re wondering why I’m picking on wheat once again. 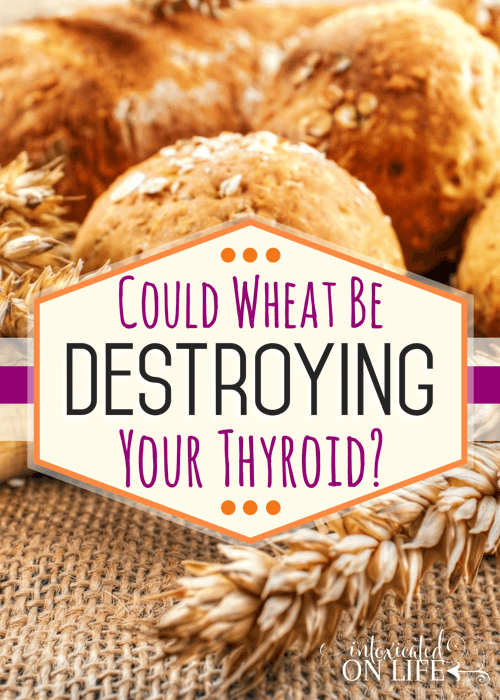 What’s the connection between gluten and your thyroid? I’m picking on wheat again because there is a strong connection between gluten-intolerance and autoimmune thyroiditis.1 Researchers suggest all individuals with autoimmune thyroiditis be screened for gluten intolerance1 and some doctors are beginning to prescribe a gluten-free diet for all of their patients with thyroid disorders. Why Are People with Thyroid Disorders at Risk for Gluten Intolerance? The molecular structure of the thyroid and gliadin, one of the proteins found in gluten, is very similar. It’s so similar that when gluten gets through your gut and into your blood stream (a.k.a. poop in your blood), the immune system mounts an attack against the gliadin proteins since they’re not supposed to be there. Because your thyroid is seen as a similar molecule, your immune system also begins to attack against your thyroid. Gluten intolerance and celiac disease have been in the spotlight recently. Despite greater awareness and education, doctors often don’t suspect gluten intolerance unless you have digestive problems. But, wheat sensitivity can take many many different forms. In 2001 The New England Journal of Medicine2 reported 55 diseases that could potentially be caused by eating wheat. This list has been expanded upon over the last several years. If you don’t have digestive problems, but you do have thyroid problems, it’s still important you take seriously the fact that you very likely have a problem with gluten. Along with these essential thyroid tests, you may also want to test for a problem with gluten. But the tests for gluten intolerance and celiac disease can be unreliable until you’ve reached a very advanced stage of gut permeability. On top of this (as if that wasn’t enough), some people who are at an advanced stage still won’t test positive to the antibody tests for gluten intolerance. Some people’s immune systems are so worn down that they are simply can not produce any more antibodies. Thus the test appears negative. Most people who have autoimmune thyroiditis have Hashimoto’s thyroid disease. This type of thyroid disease actually suppresses your bodies ability to produce antibodies. Gluten and Your Thyroid: Will Cutting-Back on Gluten Help? For this reason, it’s important for anyone suffering from autoimmune thyroiditis to completely cut gluten from their diets. You can not cheat just a little bit here and there and expect your body to heal. You may not immediately feel the effects of the cheats, but you are most certainly doing long-term damage to your body. So, once again, when it comes to gluten and your thyroid: If you’re reading this post and you have thyroid disease, you need to give up gluten NOW. Do not pass go. Do not collect $200. Go directly to wheat-free living. 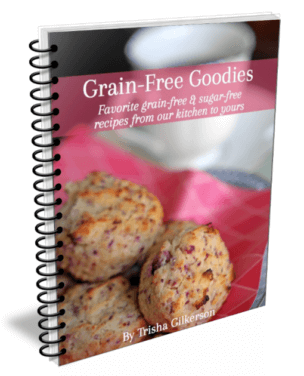 Are you looking for support on your journey to wheat-free living? 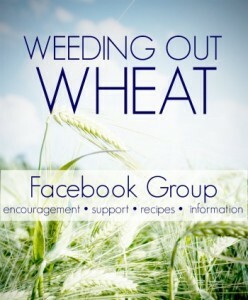 Be sure to join our Weeding out Wheat facebook group! Great helpful post, Trisha! What do you think of Einkorn or sourdough wheat bread for people with Hashimoto’s? I’ve heard they are tolerated by people with some other gluten challenges. We wrote about this a little bit in our book, but I do believe that ancient varieties of bread such as einkorn that are traditionally prepared in sourdough preparations are a great improvement over what is in most people’s cupboards. It is also true that some people that have issues with gluten can tolerate those better. But even if they see some improvement, we don’t know the long-term damage they may continue to be done under the surface. 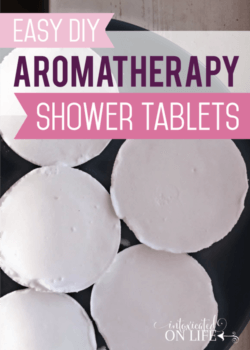 That said, I’d for sure not recommend it for anyone who has an autoimmune disorder. Most of us have eaten such a poor diet for so long our bodies really need to heal and need to be filled with healing foods. If you’re dealing with Hashimoto’s that’s a big indicator that something’s gone awry. I find this fascinating…I have had a thyroid condition for many years. I have Hashimoto’s disease also. I have 3 large nodules on the right side which I have had a biopsy done on and many smaller ones on the left side. Every time I go to my endocrinologist for a ultra sound, they find another nodule. I also have sleep apnea and use a cpap at night. I am so tired of being tired, the cpap doesn’t seem to help me although the Dr. has assured me that it is working to keep me from not breathing at night. I stopped breathing 6 times during the sleep study that I had done in 2009. You should definitely consider that food could be playing a role in both of these issues. I don’t know a lot about sleep apnea, but have read that food intolerances can definitely play a role in sleep apnea. It makes sense. If you’re eating a food that irritates your body, it causes inflammation, which then causes the apnea. If you get rid of the offending food(s), the inflammation should eventually go away. It might be something to investigate! And definitely, if you have Hashimoto’s, consider the role it’s playing in your thyroid problems. Thanks for this post. I have been fighting some sort of illness for the past 2 years and it has been so tough to find anyone that won’t think I am crazy! Finally got my food allergen test panel done and WOW! I am allergic to wheat, diary, eggs, gluten, gliadin, the works! I have been officially diagnosed with celiac disease and malnutrition because all of my minerals and vitamins are deficient. Also, to add insult to injury, my thyroid numbers have just started “the climb.” I was put on the generic and it did nothing. Have been switched to Synthroid and we shall see what comes of that. Thanks for the info on this! I am SOOO glad I am not alone! 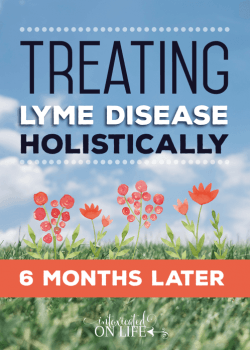 I am planning to have my doc go ahead and test for Hashimoto’s – there may be a link here as I had ANA triggers back about 18 months ago. Serious autoimmune craziness all after having baby #3. This has been so serious it even caused us to have a miscarriage this past November. The worst part of all of this is that I have been screaming (figuratively) that I am not well and that something was wrong. 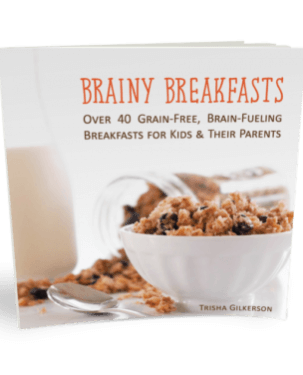 I was continually told it was my vegetarian diet (too many carbs) or I was suffering from postpartum depression. Never did anyone truly listen and it cost a life. God is with me and has been with me. He has guided me to be my own health advocate and give me the resolve to get to the bottom of this! My family needs me! Very interesting! My naturopath just diagnosed some thyroid issues. I’ve already been gluten-free for close to a year, but this is great encouragement to keep it up. Even if you don’t notice a difference, it doesn’t mean it’s not making one! Your thyroid problems may have been much worse had you been eating gluten for the past year. I hope you and your naturopath are able to get your thyroid regulated. I know it can be a challenge. Thanks for this post. I took Synthroid for years but hated the side effects and finally refused to take it any more. An alternative doctor told me my pituitary gland was the cause of the problem and gave me a pituitary supplement which seemed to help. Now that I am off gluten, I don’t have any problem with my thyroid. But most regular doctors won’t ever prescribe a gluten-free diet because then they couldn’t sell you Synthroid!!! That’s fantastic that you were able to heal your thyroid using a gluten-free diet! I am off gluten, but still need to take natural desiccated thyroid in order to keep my thyroid regulated. It’s amazing how diet can heal/destroy your body. I have/had Hashimoto’s. I have been on Synthroid for almost 10 years now. As I’ve learned more about nutrition, I became convinced that I could heal from this. I began the GAPS diet almost 6 months ago with the express intent of “healing and sealing” my gut to recover from Hashimoto’s. My Thyroid Antibodies number went from 112…down to 22…and now it is below 20 (normal). My doctor and I are in the process of decreasing my thyroid medicine right now! We’re taking it slow…and I’m so hopeful and thankful! That’s marvelous! Thank you for the comment. It’s so nice to hear these stories. They are so encouraging to others who are looking for healing! Hello, Joli! I’m curious to learn if you are still asymptomatic now that several years have passed since this post? I’d love to know if remission really is possible! I suffered from fatigue since my kids were born. Every doctor over 20 years insisted that I was depressed, put on so many antidepressants even though I would say I wasn’t. Also put onto thyroid meds which I felt no difference, but as long as you are in the “range” they don’t do anything else. It took moving and research that lead me to s new doctor that specializes in Bio identical Hormones, also he tested me for hosimotos which came out positive. Well going gluten free, helped me loose a few pounds but with the change of diet and the hormone replacement its been s year and I am feeling a lot better than I have for 20ish years. Hasimotos is something that you are born with and having kids, which messes with your hormones, kicked the immune disease in motion. Don’t settle for what your doctors are saying if what they are doing is not making you feel better. That’s great! It’s amazing what a difference diet can make. How wonderful you’ve found a good doctor. How did you go about finding your doctor? I am celiac& my Dr. says my thyroid is fine but I am so tired all of the time. Have been trying to eat gluten free but live in a small town so there aren’t many places to get the gluten free food & sending for them is so expensive. I’m also very cold all of the time. Can you advise me on what I should do? I’m so sorry to hear you’re feeling so poorly. It is very important that you completely stay away from gluten if you’ve been diagnosed as celiac. If you don’t, you will cause great damage to your body! My suggestion is to focus on whole foods. Foods that are healing. Most of the “gluten free foods” are both expensive and NOT good for you. They won’t heal your body. Focus on high quality meats, eggs, vegetables, fruits, and bone broth. I’m not sure what kind of tests your doctor has run, but typically doctors only test TSH (this is not a great indicator of thyroid function). I was able to post on my friends blog about the tests you need to request your doctor to run when checking for thyroid problems. 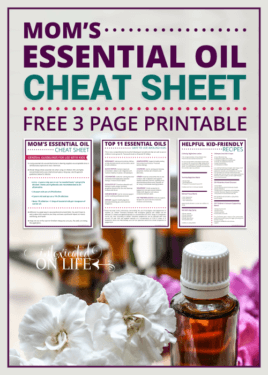 Check this out and see if it’s helpful. I hope you’re able to find some answers as to why you’re not feeling well. I know how frustrating that is! You know, I have gone completely grain free including buckwheat and quinoa and it has greatly helped my energy levels and cold hands and cold sensitivity. I have non-starchy veggies plus beans, home pressure cooked or canned-no sugar added. I don’t buy the expensive gluten free products as they are all super high carb and affect my pre-diabetes negatively. I do also use eggs, meat, wild canned fish, poultry, and nuts. Thanks so much for stopping by and sharing about the facebook group. There are a number of really good resources for those of us dealing with thyroid disorders! From the reading I’ve done, it appears there is a small percentage of the population that does better on the synthroid than the armour. Though most people do better on natural dessicated thyroid, we have to do what works best for us and realize we’re unique. One other thing to note, since Armour underwent reformulations a couple years back there are some people who used to do great on it, that no longer do. I actually know someone personally who had a HORRIBLE reaction to the new reformulation of Armour. Her endcrinologist believes it’s because there is likely a filler in it that she was sensitive to that had not been in it before. But, it’s hard to know for sure. Her doctor switched her over to NatureThroid (that’s also the brand of natural dessicated thyroid I use) and she’s doing great. If you want to try natural thyroid again, I’d definitely recommend going with the NatureThroid over the armour as it has less fillers. Another recommendation, is to be sure you’re working with a doctor who knows how to appropriately regulate your medication. It’s so important you’re on the right amount of thyroid hormone. That can make a big difference in the weight gain/loss. Weight gain is such a difficult thing, especially for those of us with thyroid problems. There can also be a number of compounding factors. If you’re eating well, have cut out sugar and cut out wheat and the weight still isn’t coming off, it would be worth getting some more testing done. I’ve documented on this site my struggle with major weight gain despite a very clean diet. Finally after over a year we’ve begun to discover what some of the underlying issues to the weight gain and all of the other crazy symptoms are. It’s been a long crazy journey with lots of doctors and lots of testing, but I’m glad to finally be headed in the right direction with treatment. Just wondering your thoughts… I started about 8 years with what was diagnosed as fibromyalgia. Symptoms with that have been off and on, more because I didn’t want that diagnosis with its negative association! Fast forward to some additional symptoms, one of them being large nodules on my thyroid. Initial thyroid tests by doctor and nutritionist were fine and biopsy was ok. Just recently I have tested higher for T3 and low for FT1.n symptoms mimic a lot of what I’ve read on Hasimotos. Thoughts? I have a question, I have been on Thyroid replacement for hypothyroidism for close to 20 years, I have blood test yearly and my levels seems to be okay, no change in dosage (100mcg). I still feel tired, depressed and not sleeping well at night and weight gain. My question is should I be on a gluten free diet? I enjoyed this article. I’m not a doctor, but I personally believe anyone with thyroid problems should consider a gluten-free diet for the reasons set forth in the post. 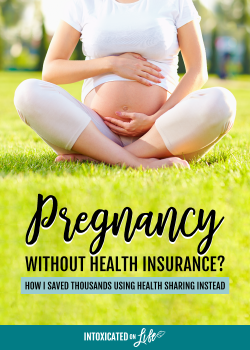 If you aren’t feeling well despite your blood work being normal, I’d encourage you to check out this post that might give you some more insights. This is great advice for everyone , I have auto immune Thyroid and Gluten intolerance ? Celiac but not tested by biopsy , I have suffered with the thyroid issues for over 10 years now and about 3 years ago I went on a protein only diet and felt amazing once I went back to eating as normal And could no longer eat gluten it became so obvious and was quiet unwell so I eliminated gluten from my diet and would never look back , I feel so much better in everything from non aching muscles to stopping getting pimples I’m not getting frequent colds or little illnesses that I used to get all the time I was always feeling run down and unwell I was taking iron supplements ect looking back I’m not sure how I managed to cope before, I would erge anyone with this condition to at least try it . 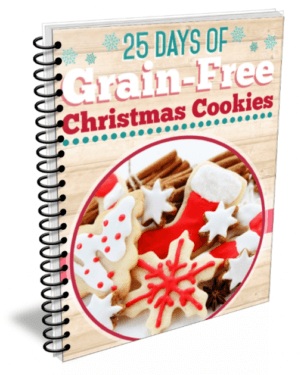 Glad you’ve seen good results from eliminating gluten from your diet! If this is true wouldn’t we all have thyroid issues? All that said, not everyone has thyroid issues because not everyone is sensitive to gliadin. Not everyones body mounts an immune response in the presence of gliadin. I hope that further clarifies! Thanks for the clarity. So by your explanation we all react differently to foreign entries just as some have allergies to peanuts and others do not. Yes, exactly. 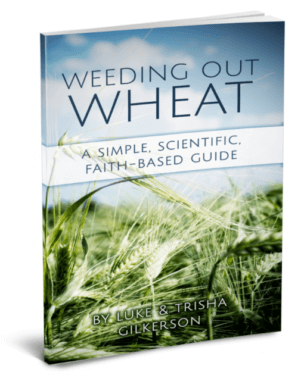 A big point of this post is, if you have a thyroid problem, it would be a good idea to consider that you may also have a problem with wheat/gluten as these often go hand in hand. I’d be sure your doctor is checking your Free T3 and Free T4 when regulating your thyroid medication. Those are the actual thyroid hormones and will be able to tell you what needs to happen. Often people are low on T3 when they take levothyroxine. Ideally, your body should be converting T4 to T3 because T3 is the more active form of the hormone. But a lot of our bodies don’t do that very well. Many people, including myself, do much better on a naturally desiccated thyroid replacement therapy (Armour or Naturethroid). Many doctors don’t want to prescribe this because the pharmaceutical industry has convinced them it doesn’t work as well, but research shows for most people it works better (FYI the pharmaceutical industry doesn’t make much money on the naturally desiccated thyroid).